Listen in to hear how Breakwell’s journey in comedy writing began with emailing random people and evolved to writing for his college paper, then blogging, and finally into social media. He shares how he felt Twitter (as opposed to blogging) helped him become a better writer, and the amazing story behind how Twitter and Buzzfeed literally brought him overnight fame. Breakwell is also the author of Only Dead on The Inside: A Parent’s Guide to Surviving a Zombie Apocalypse, and upcoming BenBella book, Bare Minimum Parenting. Listeners will enjoy a lively discussion between Breakwell and Yeffeth as they dive into Breakwell’s primary strategy of book-writing (on his phone!) and the unexpected career title that has come from all his comedic fame. James Breakwell is a professional comedy writer that is best known for his family humor Twitter account, @XplodingUnicorn, which boasts more than a million followers. Breakwell is also the author of Only Dead on The Inside: A Parent's Guide to Surviving a Zombie Apocalypse, and upcoming BenBella book, Bare Minimum Parenting. Glenn Yeffeth: Welcome to the Building Books Podcast. I'm Glenn Yeffeth, publisher of BenBella book and on this podcast we will talk about ideas, authors and how publishing really works. 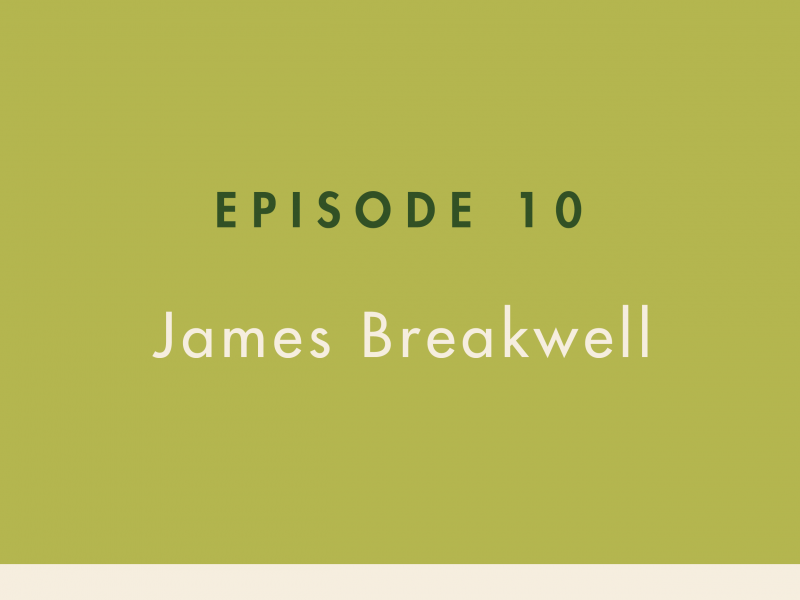 Welcome James I am thrilled to have James Breakwell on the podcast today. James is the author of Only Dead on The Inside: A Parent's Guide to Surviving a Zombie Apocalypse and our upcoming Bare Minimum Parenting actually out this month which we're very excited about. I don't do a lot of comedy books or humor books just because it's so hard to find things that are genuinely funny but James is hysterical. He's done a fantastic job both in terms of building of his online platform and also in terms of his fantastic book. Anyway welcome James. James Breakwell: Thanks for having me. I'm excited to be here. Glenn Yeffeth: Just to back up how did you get into the business of humor? James Breakwell: I started a long time ago. My first platform was just emailing random people who didn't ask to hear from me in high school. I [inaudible 00:01:10] some extra time at the end of the computer literacy class so I did the logical thing most guys do and I started writing the fake book of the bible and I emailed it to a couple of people. They were sitting a few rows ahead of me and I watched them open it and I watched them laugh. A light bulb went on in my head. I'm not the class clown, I'm not a stand-up comedian but I could write things and do this so I start emailing more and more people. I went to college and wrote for the school paper there took over a column and just wrote big humor columns there. Then from there I moved into blogging. Briefly tried the newspaper world and then tried blogging for a lot longer and eventually jumped to social media. James Breakwell: It's been trying out different platforms to get those jokes across. Glenn Yeffeth: Where you getting some traction in blogging or was social media really the breakthrough for you? James Breakwell: No traction in blogging whatsoever. I wasn't in it quite at the golden age but I was in it at the tail end when some people were still going viral and I would just watch people just explode and wonder why isn't this happening to me. Looking back I understand it a little better. Yeah my first book with you guys was 40000 words. That blog was 300000 words. Every word of it was comedy articles. I looked back through it. Some of it was pretty good some of it wasn't but by the end my style was pretty much what it is now. I couldn't get people to read that thing for free. My whole goal with that was when I had gotten out of the newspaper business because originally I thought I was going to be the next Dave Barry. I'd work my way up and get a column and then get book deals. When I realized that wasn't going to work it I thought well I'm going to build up an internet audience and then publishers are going to come to me. James Breakwell: That ended up being a lot easier said than done so I worked on that blog forever and then finally I jumped over to social media to promote that blog. When I got on Twitter, it turned out that it was just uniquely well suited for developing jokes. I hit my niche there and I figured out what people wanted for me, I figured out how to write better, more [inaudible 00:02:57] jokes and then that's how I eventually went viral and then from there I circled back to the longer comedy. Glenn Yeffeth: Yeah I was just going to say Twitter just seems to be a great fit for your style of punchy comedy. Are there other platforms you're also focusing on? James Breakwell: I am everywhere. When we first talked years ago I think I was just on Twitter but I've expanded outward. You've really got to be broad because platforms can collapse without any notice. Vine did and took a lot of people who are making a full time living off of Vine, Snapchat seems to be on its way out. Now I'm on Twitter, Facebook, Instagram and I'm pushing YouTube hard. I have a million followers on Twitter. If I had a million followers on YouTube I would be rich I wouldn't even have to write books. It's just a totally different platform. My kids I tell them I have a million followers on Twitter and that means nothing to me but one day or nothing to them but one day one of the YouTube heroes is reading tweets and he read some of my tweets and they said dad you're own the internet. I was like I live on the internet that's where I am. It doesn't mean anything to them it's on YouTube. I'm pushing YouTube hard now as well. James Breakwell: As well as the mailing list, I've got it where I send out a comedy article once a week. I've moved into podcasts as well. I've got two of those. Wrong and Wronger where we debate pointless topics and it's pretty funny. Then 10 mins to save your marriage where I team up with a psychologist who we try to solve your relationship issues in 10 minutes or less. Glenn Yeffeth: I love that. How would people find those? James Breakwell: You can find 10 minutes to save your marriage and Wrong and Wronger on iTunes, Stitcher, SoundCloud, Spotify I think I was wrong and wronger. All the typical channels they're there. I'm not going to claim we're a big deal in the podcasting world, every time you jump from one platform to another you have to convince people all over to believe in you. I think we put out a good product and we have fun which is the important part. As far as Twitter I'm @explodingunicorn without the E, on Instagram I believe I'm James_Breakwell and on Facebook you can find me with James Breakwell exploding unicorn. On YouTube I'm James Breakwell. Basically if you go anywhere and googled James Breakwell I'll probably pop up. Glenn Yeffeth: That's right. Talk to me about how you built that platform on Twitter over time how did that come about? James Breakwell: When I got into this I wasn't really a parenting blogger. I started writing jokes long before I had kids, long before I was married but Twitter gave me two things I didn't have before when I was blogging. Because when you blog I'd spent five or six hours on a blog post. Write a 1000 or 2000 words and you throw it out and you get to comments back haha that's funny and this is stupid delete your blog. It's really not helpful to develop as a writer but Twitter gave me focus and it gave me feedback. The way Twitter works is if you tell a joke and it's good people will retweet it and it spreads and if you tell it and people don't like it they don't retweet it. You get to succeed on a large-scale and fail on a small scale and you can do that over and over again, that's how I develop the back and forth conversation style on there. James Breakwell: I didn't invent that by any means. Joke formats have been around forever but that's where I found I had the most success and that's where I found out people wanted to hear about jokes about my kids. With my jokes some of them are real and some of them are exaggerated and some are made up but they have that kernel of truth that makes you relate to them and say yes my kids do that or I can totally see my kids do that. I figured out how to walk that line, how to get parts of life that people actually care about and edit out the winding and the crying or at least enough that people want to read the tweets. I hit that sweet spot and I did that for years and then I built up a following gradually to 200000 people and then Buzzfeed run an article and that was the spark I needed and then it just went viral from them. Glenn Yeffeth: It's interesting. It sounds like Twitter has just been a great learning platform where you can constantly try things, try things, figure out what works and then do more of what's working. James Breakwell: Yes I would like to say that Twitter was this amazing platform that just discovered me and I was already great but really when I look back at my old tweets they're terrible. I just didn't know what I was doing. I really have become a better writer so I think earlier on when I wasn't gaining followers there was a reason for it but I was willing to learn. I think if you're going to advance in anything you've got to be willing to learn. Especially in comedy writing there are people out there who are doing stand-up comedy doing out. Five minute set here, five minute set there and that's just a brutal way to develop material. Whereas you can sit at the comfort of your own home and hide behind your screen you can throw out a lot of jokes really fast and get wide-ranging feedback. You're not getting it from 10 people in a mostly empty room. You can get it from thousands of people at a time. James Breakwell: That feedback is scalable that feedback is just as useful if you have 100 followers as if you have a million followers. You figure out what line is a good joke for you, what line is about joke and you could build from there. It really works for everybody. Glenn Yeffeth: Where you thinking from the beginning that I'm going to build my platform and then try to monetize it with books or did that just evolve? James Breakwell: Yeah. Yes I always wanted to go to the point where I would write books. I had a bunch of different schemes over the years for how that was going to happen and the one that finally worked was social media. That was kind of always the end goal, the pie in the sky and then at the end there would be a book. In between I didn't know all the steps. One of these steps might have been a miracle happens. That was the idea. Yeah I always wanted to get to that point. I think a lot other people want to get there too. Originally I was looking at how to get a book deal and you have to write a query letter send it out to agents and all of that but looking back now it turns out the comedy writing I do which is technically non-fiction even when it's a zombie book for those kind of books publishers will not publish them if you don't already have a platform. James Breakwell: They'll buy a fiction from you if your unknown if you don't have any readers but they typically won't buy nonfiction from you so it turns out the way that I stumbled into this way the only way that I was going to get anybody to get to take me seriously anyway. Glenn Yeffeth: I think that's right unless you have some kind of unique expertise which in a way it is own it's its own form of platform. You just won a Nobel prize in whatever. It's having some kind of platform is very important for nonfiction. In fiction it's so hard to get published in any case but you're right you can be an unknown and tried something that the right age and feels is brilliant and get published and get a huge deal as a first-time author. It's like sweepstakes. It's rare. Tell me about how you got an agent how did that happen? James Breakwell: I did the grind forever got ... Again everybody when I tell this story they're like it happened so fast but that's like looking at the last 100 meters of a marathon and be like well that was a short right. You just see the end and you don't take into account everything that happened before. I've been writing for years. I apologize if you hear my pig in the background she's waking up. This is my life I don't know how much the sound dampening is going to stop it. I got up to 200000 followers and then buzzfeed ran this article and buzzfeed had run articles about me before not just about me the run-around up of tweets and after a while their editors figure out who write with jokes every day and just go back to the same sources. When they contacted me and said they wanted to interview me I thought nothing of it. Then the article came out and I checked their Saturday morning it came out they didn't even tell me when it was going to run. Saturday is really low traffic day. James Breakwell: I looked and I gained 3000 followers since that morning. Well, that's weird. I guess that article gave me a boost. By noon I had gained 10000 by that night I had gained 40000, by the end of the weekend I had gained 100,000 followers. By Monday morning newspapers were contacting me from around the world. I was getting emails from the daily mail and stuff like that. I was at work mind you, in my cubicle trying to answer these from my phone. I ended up with a rolling press release I just copied and pasted answers from the last newspaper to the next newspaper and then answered any new questions they had. Out of that [inaudible 00:10:46] with trident media group contact with me and asked if I wanted him to represent me. I looked into it he was a great agent and a great agency so I said yes. Now looking back I realized how lucky I am because they are pretty big player out there. After that form or agents ended up getting in touch with me and was in position I turned them all down. James Breakwell: It sounds like a really power move but really I just said yes to literally the first person who contacted me. But it was needed. It was the fruition of everything where in the end the book world did come to me. Now once we were actually submitting books the balance of power shifted again in favor of the publisher's but for a brief while there I was in charge calling the shots and that was pretty cool. Glenn Yeffeth: It's interesting because we see with our books all the time where they'll be some media and it will explode a book or it won't explode a book. I think the difference is what do we people find when they see the material. In your kids I think they buzzfeed exploded you but it was because when people went to your Twitter feed they loved it and they started sharing stuff so it was a catalyst but what made it work was the quality of the material. James Breakwell: I've used this analogy before in speeches it's kind of like a forest fire. For a forest fire to take off you need a spark but you also need a lot of material there on the forest floor to make it take off and that's what I had. You'll see all the time now that they've changed a Twitter algorithm. Somebody will write one relatable tweet and they'll get have a million lights it’s incredible and you'll go you look at the account and they still have 500 followers. Nobody follows them because they have one incredible relatable tweet and you go to the account and there's nothing else like that. It's just them tweeting about work or school or food. With my account for the time I exploded I had 15000 jokes just like the 20 that buzzfeed had put in the article. They put in clickable links to be clicked on that. You came and found 15000 more then what I had put out. These were all things that I had tested just vigorously looking at what works and what doesn't. Glenn Yeffeth: I remember that. James Breakwell: Going crazy. That account for 300000 followers in a couple of weeks and I thought this is it, I've made it. You really can't monetize pretending to be a Jedi, it doesn't work. Nobody has offered me a book deal for that and that was just a few months before I went viral with James Breakwell. There I was really exploding all over the internet but it wasn't under my own name and it wasn't until it happened under my own name and my face that I was able to actually advance my career. Actually since then I've scaled back I used to have a bunch of parody account but there's really no money in it. If you want to build a brand if you want to get to book if you want to get to add deals or anything you've really got to do it under your own face or it will they won't do you any good. Glenn Yeffeth: Now in transitioning to YouTube and video what have you learnt so far about making that happen? James Breakwell: I had mentioned is briefly earlier but every time you have to re-convince people you're worth it. I have people who say yeah, I read every single one of your tweets. I'm like great listen to my podcast or watch my videos. They're like I don't know about that I'll give you 10 seconds for a tweet, I don't know if I'll give you five minutes for a video on 15 minutes for a podcast or 4 hours for a book. That's really what my business model has become. You hook people with 10 seconds of comedy and then I try to get them to the newsletter where they'll read 1000-2000 words at a time and then maybe they'll watch a video maybe they'll read a book that's kind of how it work. In this goal I'm moving towards this I ended up with a career I didn't expect as a social media influencer. I never at any stage of this thought well at some point of that so many followers that people would pay me to advertise products. That's where I've ended up. James Breakwell: There's some PR agencies that contact me over and over again because I'm pretty family friendly and easy to work with. It's not like I'm chilling poison or anything and selling diapers and things I actually use. Pizza and stuff like that so it's worked really well. I see out there authors who try to go full time doing that and I think right now unless you're a big name I think for the large middle class of writers who write books that they might or might not but you're not getting million dollar deals I think it's really hard for them to earn a living getting paid once or twice a year whereas now that I've gotten two books I don't just have books I have this entire influencer network set up with advertising and all these other revenue streams. James Breakwell: I think originally I thought well someday I'll write books and that will all fall away but now as I look at it I think more and more authors are doing a hybrid style of setup where they make money off books and a podcast or books and social media or something else. There are two things that dub tale together very well but there are two distinct revenues dreams. Glenn Yeffeth: There is a feedback loop between them when people read your book they feel more invested in you and then they follow you more on social media and it is a positive feedback loop that can happen if things go right. James Breakwell: Exactly. One part definitely helps the other and I've been very lucky. I know some people out there; they get a negative interaction with fans. I see big names out there all the time just getting into battles with them. I really haven't done that. I do my best to ignore the negativity when it pops up or for the most part my followers are pretty good. They're likely young parents and they just don't have time for that kind of stuff. I don't have a lot of trolls. They've been pretty supportive and they've helped me as I move from one platform to another. Yeah if I can make it on YouTube that would be great but in the meantime just with Twitter and Facebook and Instagram and all of those things it's proved to be pretty stable. Glenn Yeffeth: Yeah I think that's smart in terms of not engaging. I do wonder who has the time to argue with people they never heard of on the internet but apparently a lot of people do. James Breakwell: I get it because as much as I want to ignore it, when I do read comments they are there certain comments that he teaches right that you can't brush it off and you brute over it all day but I finally gotten to the point where I realized if I argue about this it's not going to make it better. I'm not going to change their mind nobody changes their mind on the internet. In real life it's unrealistic to think everybody you walk past on the street is going to like you they just never tell you. I just have to remind myself that when somebody doesn't like me on the internet is no different at the way they don't like me in real life and if they don't respond to them I'm just giving them a platform and it ends up looking bad for the both of us. Nobody comes out of an internet fight looking good even if you're right. Glenn Yeffeth: Right no question. Talk to me about ... Your first book was Only Dead on The Inside. Talk to me about your writing process, how did you develop the book? James Breakwell: I guess I had an advantage over other writers in that I didn't have anything to say which is my greatest. I've heard a lot of people are like well my Facebook is what I thought about for years and then they make it and they don't have a second book. I didn't even have a first book. What people really wanted me to write was stuff my dad says. It's a different word than stuff but they wanted me to just write a book of tweets with some parenting stories thrown in. I didn't want to do that for a whole bunch of different reasons. I didn't want to do it because my tweets are a mix of fact and fiction and on the internet that's fine but maybe that's not so fine in a book but also because I wanted the whole time I didn't want to spend my life writing 140 characters which was the limit and the time, I wanted to convince people they could trust me to write a real book. James Breakwell: I thought the zombie concept was bridging that gap and when I came up with it it's not like I had all these chapters thrown in there which is just a core idea. Being a parent now isn't that different than being a parent in the zombie apocalypse. Our lives are already kind of a disaster and you're already taking care of these little monsters. They're just these big monsters outside too. I went from there it was a very compartmentalized book because here's you driving to work today how would the situation be if you're dropping your kids off at daycare and there are zombies? Or here is you making dinner, how is that different if there are zombies? It was very easy to write. I wrote the chapters out of order and it was just fun to write, it was quick to write. I'll tell you my tools of writing changed in there as well. The first draft going through that was very traditional; I did it on another PC or a laptop. James Breakwell: I ended up a situation I had to fly out to LA for an ad deal and coming back the laptop was just too huge and cumbersome to open up with the way that my plane was. Because of course I was flying super economy or whatever. I started editing on my phone and I had a breakthrough because I do Google docs for everything and I could do it on my phone almost faster than I can do it on the PC. On a PC you get that big blank screen and it's really easy to jump down the page if you get stuck but on your phone the screen is small enough that you got to fix where you are one line at a time and go and it ended up just regulating me at the perfect speed so I did a lot of the finishing work for that book on my phone. Glenn Yeffeth: That's really interesting. James Breakwell: I found the function in the Google Docs and I was like I wonder how well this works and the first day I tried it I wrote 10000 words. It was incredible. After that I got this whole first draft on and I got the book deal and then I went back and I was like boy I hope that actually worked I haven't gone back over it. I hope it’s not garbage. It was garbage but it wasn't anymore garbage than any other first draft I've done. All first drafts are garbage and so I've gone through and edited. I'm like wow I'm actually right where I need to be but I got there a lot quicker. It sounds incredibly unprofessional but yeah I write books on my phone and it's working really well. Glenn Yeffeth: Actually no, I've heard about, there's a famous science fiction writer I think he's name is Kevin Anderson and I remember reading about his process and he's a big hiker and he would go hiking for miles and for hours and hours just talking through his books. He would record it, it was before the days of the Google Translate a secretary type it up and that's how he'd have his first drafts while he was hiking. James Breakwell: I think there's a lot to be said for that. I actually when I'm going back through this draft now but I'll be like yeah I remember was walking in the woods here doing that or I was pacing in my living room. It's kind of interesting you remember where you were. I do a lot of the writing in the car. The very nice thing about being on your phone is you're never really away from your work space. You can get stuck in line at the grocery store, you're in the lobby at the doctor's office you can just pick it up and write, but when we went on family vacation. It's like oh no we got a three or four or five hour drive. Will my wife graciously volunteer to drive and I can just work on the book on my phone? I will say that when I'm in the car with her I typically don't use voice to text because we've got a movie playing overhead and I'm just going to end up all the lyrics for frozen in the book. I use swiping then. Glenn Yeffeth: I have to mention that you are also an artist. James Breakwell: You can put that in quotes. Glenn Yeffeth: Only dead on the inside, for those of you who haven't seen it and I definitely recommend that you get this book. It is full color and it's filled with color illustrations that are really hysterical including graphs and charts that are also very comedic. I love that aspect of your style. Talk about that a little bit, I wouldn't say that you're going to put in any professional artists out of business. James Breakwell: If your bad in the same way every time it becomes a style. James Breakwell: That's what I did. I created those stick figures that were bad the same way every time and so it looks like it's intentional rather than being the full extent of my abilities. I started that web comic years ago and the main characters were modeled after their stick figures on bathroom doors. I was like you look at the stick figures you know it's a guy and a girl. I'll have that be me and my wife, we'll make some smaller stick figures for my kids just the work. Originally they didn't even have other colors they were just all monochromatic. I started that and my wife said don't you do this, you don't have time for it and she was right she was absolutely right. Everything I start something else I don't have time for it. But I started doing those web comics and the whole idea was that a blog post ... This is back when I thought blogging was going to make money. James Breakwell: A blog post took five hours. I said what if I make a stick figure comic that takes 10 seconds but you still come to the page it's the same amount of advertising revenue. It worked. I started making one of those every day and then I moved on, I started making web comic out of my kids drawings and I started making one. I had a real artist come in and I tried that briefly. Not briefly I'm still doing it but I moved the pieces around. It's been interesting because I guess now I kind of I'm a comic artist. My main comic has 1600 comics on the internet, my other ones are both over 1000 and now I've gotten them published on one book and I'm coming out with another book. It's just you don't need a lot of artistic details to get the message across. It lets me go beyond tweets. You can be a little bit more slapstick, a little bit more surrealist than you can if you just write it in text in a tweet. Love that about it. The silence has hit a little harder when you have a black blank panel. James Breakwell: It's real easy even with my stick figures you say that's a flamethrower, that's a horse. You don't have to be that great at it. If my kids can come up and tell what it is, it's good enough that's my line. It turns out it's a good thing I didn't abandon it even though for years I didn't make any money off of it now I started putting those on Instagram and for a long time my Instagram account wasn't growing now I'm putting those on Instagram and suddenly my Instagram account is exploding again. I think long time actually it's going to be a good from my strategy because people always us what are you going to do when your kids grow up? Well in my web comic my kids are always going to be the same age so I can always tell the jokes I am now rather than them coming from my mouth in a tweet it will just be with his stick figure comics and I can keep going that way. Glenn Yeffeth: No question and really these are ... The level of quality is exactly right for what you're doing. It kind of reminds me of the early [inaudible 00:24:38]. Where it was just enough to get the joke and it really worked. James Breakwell: There's a lot of people who are amazing a drawing and there comics just around that funny and I think maybe it's more important to come up with the joke first second rather than the other way around and there are certainly people comic fans out there who will disagree with me but I'm definitely in the joke first comp. Glenn Yeffeth: Let's talk about Bare Minimum Parenting. The only dead on the inside which is a parent’s guide to surviving the zombie apocalypse that book of course there's no message that because until the zombies come there's really nothing to be learnt. Bare minimum parenting it's a hysterical book but it seems like you're also delivering at serious message. Is that true or am I reading too much into it? James Breakwell: It is true but it happened by accident. I was on somebody's podcast the other day and they called it slightly revolutionary and I thought that's the best compliment ever. Yeah I set out to write a book of jokes and just ended being a funny laid back parents and I accidentally ended up proving a point. It's not a point that's built on facts and figures it's not built on expert testimony or studies or all of that because I think all of those things they don't really line up with reality. Every time you see a new study coming out, all it tells you is you're doing everything wrong, kids are too expensive, you're not doing enough for them and you just spend enough time but then if you look at reality, if you look at what we turn out as adults. There are thee decisions that we agonize over when we're raising our kids. James Breakwell: Should we stay home with our kids or should we send them to the daycare. Should we breastfeed or bottle feed. Are we going to get the right stroller, are we going to get into the right daycare. If you meet somebody in their 40s, you don't know what daycare they went to, you don't know if they were breastfed of bottled but it just all averages out and I really don't think there's any correlation along there that you can prove. There's too many other factors that come into play just trace anything back to those early parenthood decisions. If we're all going to be average, if we're all going to be mediocre any way, rather than writing a parenting book about how we can overachieve I wanted to write a parenting book about how we can do as little as possible and still achieve that mediocre status. James Breakwell: As I went through this as I read through this line by line, joke by joke I kind of surprised myself I thought you know what I think kids are better off if you take this bare minimum approach than if you're an over achiever. I think overachieving as apparent actually hurts kids whereas being lazy and laid-back might actually be better for them. I don't think you're hurting kids at all by doing this I think you're actually helping them out. Glenn Yeffeth: You know there's actually a new book that just came out by Jonathan Hague. I'm a fan of his, he's a great social scientist. It's called the cuddling of the American mind. You've probably heard about this. Like an oncologist there's all these drive for safe spaces and such concerns about safety but at the same time anxiety and depression are way up among college kids and he traces it back to sometimes in the mid-90s we decided kids should never be on their own, parents should always resolve any issue or adults of some sort and these kids have never really been exposed to solving their own problems. Now it just created a huge amount of anxiety so there's actually a whole book that just came out that supports your thesis. James Breakwell: There's probably just as many that go against it. I think the bottom line is that every generation is always the worst generation to the generation that came before it. You figure human being have been around depending on which scientists you talk to homo sapiens maybe a million to 200 thousand years somewhere in that and in that time every generation somehow we raise our kids to have kids of their own and we just keep going. If we could just make it through with no technology when we just had spears fighting off saber tooth tigers surely not with all the safety features we have in place our lives should be easier rather than harder. I think that all the stress we put in there worrying about whether we're doing too much or too little I think it's all self-inflicted. I'd say the core thesis of my book is whichever way your parenting you just need to worry less about it and accept that your kids are going to turn out how they turn out no matter how what you're putting into it. Glenn Yeffeth: That's always been my feeling as well. When you have kids you realize how much of that personality is just there. You had nothing to do with it it's just there. James Breakwell: I have one sibling I am the oldest of seven kids and the next brother down when I was much younger he'd be the one I picked on the most and he'd grow up he was a lot ... He looks like me but he was a lot more introverted loved computers and stuff more than that and I thought. No, I ruined this kid, this is all my fault. But then when keep number 7 came around he was just like kid number 2 but by kid number 7 I wasn't even in the house and I thought there's my control this isn't my fault this is genetics that kid just turned out how he turned out. I think parents go through a lot of that too. I think we look at our kids personalities and say my gosh I did this and maybe you did in terms of genetics or environment but I don't think it's going to be in terms of any one parenting decision you make. Half the parenting decisions you make your kid isn't even going to remember. James Breakwell: A big point of my book is if your kid isn't going to remember anyway just portray their childhood as best as you can, lie about it and they're going to think they had a great childhood even if they didn't. You are the record keeper. Glenn Yeffeth: All right you definitely find a lot of examples of kids that grew up in an alcoholic haze and still achieve great things. They're in the news all the time. James Breakwell: If you're a truly horrible parent which again this bare minimum book is not about being a horrible parents at all, it's not about those things but in those cases where you are a horrible parents you don't really stop the kid either you just become part of their heroic backstory. Look at what they overcame. You'll get it up out of you whereas if you come from a good home it's that guy came from a good home what's his excuse? You can find the positives in everything. Glenn Yeffeth: Definitely it's a positive to be such a horrible parent that you hurt your kid but your ability to make them into a genius seems questionable doesn't it? James Breakwell: Yes I think the idea that you can push them to greater hate to be this world changing genius I just don't think it's going to happen. Look at the people who truly are geniuses how many of those people are actually happy? How many of the airlines would you actually want? You get constant biographies coming out about this great man or that. Steve Jobs had all these biographies come out. Would you really want your kid to grow up to be Steve Jobs even with all that wealth? Is that the person you'd want to sit down with other things giving dinner? There's a lot of these so called geniuses who are just miserable human beings and not very fun to be around and quite frankly don't lead very happy lives. I think if your kid does turn out to be a world changing genius great, but don't make the miserable trying to turn them into that because even the end destination isn't necessarily all that great. Glenn Yeffeth: Now isn't one of the difficulties the social pressure that parents have to deal with? James Breakwell: Yes I did without every day on the internet and I talk about that in the book about how important it is to ignore it. Because it still hits me too. Somebody will comment just write and it sticks with you and upsets you but you have to learn to deal with it in your own way. I've learnt to deal with it that if I don't read the comment it doesn't hurt me that's my line. If I read it it's going to bother me no matter what so if I post something and I know it's going to irritate people that's when I just don't read it. In the parenting book I think I have a line. There's a reason it's called a parental peer pressure not parental opinions that are easy to ignore. It's always going to be hard to step away but if you look at it objectively why do we even care about the opinions of these people. The only thing we have in common with them is that we both reproduce. That's it. James Breakwell: It's not like you share all these other interests, it's not like you're going to be lifelong friends. It's just somebody offering their unsolicited opinion and who's to say their way is right. Again we all parent in different ways, our kids all turn out more or less the same. I don't think anyway is more right than the other. There are no perfect children and if there are no perfect children there are no perfect parents are so we need to all give it a rest. Glenn Yeffeth: I have to ask this question is it possible that your bare minimum parenting while your wife is maximum parenting to make up for it. James Breakwell: I think we're both on the same page about that. I think our parents come from that too. Both kids our parents never really pushed us. We did what we did but we never had that pressure coming down. My wife and I we both work full time and now I'm transitioning into all the writing so for a while I've been working two jobs but yeah we've never been the type to helicopter in and do all of these things. We keep our kids alive we keep them well fed but again we depend on them to entertain themselves and be a little independent. That would be a very different book. You have one parent take it easy and one parent do everything so definitely don't do that. Make sure both parents on the same page before you engage in that. Glenn Yeffeth: That's good. Now how many kids do you have? James Breakwell: We have four kids. Eight, six, four and two. Glenn Yeffeth: I have to say with four kids I imagine maximum parenting is really not in the cards in any scenario that's a lot to deal with. James Breakwell: There are people out there who already have their four year old in soccer and in all these activities and tumbling and all that. I think what is the point? Is your kid going to be the next world cup player. I think kids at that age they enjoy things to a certain extent. I think they might enjoy half an hour of soccer every once in a while do they really need to go to two games a week. It ramps up out of control so quickly. I know when I went to school I did every extracurricular activity under the sun to stuff my resume and if I could go back in time that's one thing I would change. So much of that stuff that we think is important just doesn't matter. I would skip I think the majority of that except for the stuff that I actually enjoyed. I'm going to try to really do that with my kids. Is are you doing this because you want to do it or just because your friends signed up or because you think it's going to help you in some other Machiavellian way. James Breakwell: Because with four kids I don't want to be driving them to 16 practices a night. We got to draw the line. I think I'm going to draw it early. It's a lot easier to quit an activity if you never start it in the first place so I think we're going to be real selective about what we get them enrolled in. Glenn Yeffeth: I'm an earlier generation. I grew up in ... My teenage years were in the 70s. We left the house in the morning to go walk to school and then walk back and then spent the afternoon running around the woods and we just have to be home for dinner so there was no scheduling of anything. I guess now my parents would have gone to jail. James Breakwell: That's the thing everybody grew up like ... It was amazing. I kind of had a mix of that I remember I went sometimes in the summer before I was old enough to drive but I was old enough to bike around I would bike all around my home town. I could go miles away not necessarily telling anybody where I was and it's totally different today but I think statistically the world is actually safer than it used to be. It's just that all those bad cases when there's a child abduction everybody in the state hears about it with an amber alert which is good because everybody can help look but at the same time when there's a tragic murder everybody hears about it and while statistically you're no more on safe that before, suddenly everybody keeps a close eye on their kids/ I think we're just much more aware of the dangers they are so I probably never going to go back to that free range parenting lifestyle which is a shame because I think it probably did kids a lot of good and I think it was certainly much better for parental sanity. James Breakwell: I think this is probably the first time in history where you're expected to keep your kids indoors with you all day under your supervision. I think that's probably contributed to quiet of you nervous breakdowns. Glenn Yeffeth: You're right the statistics show that it's actually considerable safer than it was in the 70s and the 80s today. Not only does it contribute to the parents breakdowns. Like I was saying earlier it's not good for the kids to constantly be the first time they're not totally supervised is when they're 18 in college. James Breakwell: Yeah I think there are kids out there who legitimately have no idea what to do with free time. I have a friend who their kid is in junior high and they were going to two or three hours of soccer practice tonight in junior high and the crazy part was that this person inspired an entire chapter in my book about sports. Because I looked at that and I look back through my own life I thought what are we doing with sports, what a waste of time. She was actually injured and she still had to go there and sit there for 2 hours a night. I thought that is insane there is no other area of life where you have this authoritarian regime where you're going to show up no matter what. If you get hurt on the job you go home with worker's comp, if you get hurt on a battlefield they send you back behind the lines you don't stay up front and clap for the other soldiers. James Breakwell: Here the only here do we say the only thing that matters is the team. The schedule practices without consulting you, they schedule games without consulting you. You don't get vacation days you didn't get personal days. If you show up you lose your spot you lose the privilege of showing up every day. It's a totally work thing and we think we're preparing them for real life but I don't know what we're preparing them for. Because is no other situation in your adult life that's going to be like that where there's somebody else had such total unquestioned control over you. I'm a big fan of stepping out of spots or at least only doing the sports that you really like and then maybe skip the traveling team and just do the local stuff every once in a while. Glenn Yeffeth: This may not be a real connection but it does seem like now this social media world we have where somebody says something you don't like you want to get them fired or somehow tell the boss or it comes from an environment where we're so used to telling the teacher because we don't know how to resolve disputes between people anymore. James Breakwell: Yeah, we're definitely in a world of immediate consequences. I'm aware of that every single day that I get on the internet that I'm playing with fire. That it would only take one tweet to end my career. There's just no forgiveness out. I think it's pretty commendable that I won the title for that while I'm trying to tell jokes at such an age without being destroyed. Yeah everything is just really touching after you really cognizant of it and I'm not here to change the world and say we can't do things anymore I'm just trying to survive in that world and saying in that world maybe it's possible to do less. With social media and everything I think parenting is different just because there's a record of it. The only thing you remember from when your parents are raising you or your own personal recollections of this or that but now you put things on the internet, on Facebook on Instagram. James Breakwell: It's there forever so it's that much easier for everybody to see and judge you whereas before what you were doing whether it was good or whether it was bad, more or less went unseen. Glenn Yeffeth: Any advice for up-and-coming authors who want to walk the path that you have? James Breakwell: I think you need to write first of all. You're not going to get anywhere without writing. I think there's probably 1000 writers with a book in their head for everyone writer that puts something down on paper. What you write doesn't have to necessarily be a book when you write every day. For years I was writing books, I was writing blog entries. Then I was writing tweets, writing web comics. Those are all writing. Anything that you put down in a way that other people can consume that's writing. That counts. Even if it's just doing a scripted video, anything like that. You have to be putting content out there in a way that you can get feedback so that you can narrow it down and so you can get better and you can build an audience. That's really the key. James Breakwell: If your going out there without that I mean it's going to be hard because one you don't have the support base to begin with to take to publishers and two your style hasn't been refined. I shudder to think of what my writing would be like if I was still like what I was like in 2012 writing jobs rather than what I was like in 2016 when I finally went viral. In between there I had four years of feedback to get me to that point. You have to get some where somebody is helping you get better. That doesn't mean you listen to every criticism out there I mean there are some criticisms you just have to ignore. You need to figure out either what the bulk of your audience wants or what your two really insightful people want who's judgment you can trust and go with that. If you are going with one or two people whose judgment you trust make sure they themselves have succeeded. There are so many blogs and guides and books out there by people who themselves have not necessarily succeeded in the publishing world so make sure you're taking advice from somebody who is actually making a living at this rather than somebody who's also just trying to climb the ladder like you are. Glenn Yeffeth: It is very interesting what you said about your earlier experiences with Twitter or experiences to this day with Twitter whereas I think I feel a lot of standup comics who got their jobs and built their ax by going little show to little show. Seeing what works, seeing what doesn't. You've replicated that same process from the comfort of your living room. James Breakwell: On an industrial scale. James Breakwell: I put out a joke with a million followers and any given thing even a small one is going to be seen by 80 or 90000 people at least. You'll figure that's enough people to fill a stadium is just a whole different level of feedback. I will see one thing, it's interesting. Standup comedy and written comedy are two completely different mediums and I think there a lot of standup comedians who are absolutely hilarious in person who can do way better than I ever could on a stage because so much of their humor is there body language. Their presence, their pauses, their delivery all those things. When you get on Twitter though, it's the great equalizer you strip all of that away and all you have is your words. Which is why it translates so well two books because that's what you're doing. I think there are a lot of standup comedians out there who struggle on Twitter, who don't have the following they should despite being hilarious because they don't have those other tools at their disposal. James Breakwell: That the presence and the delivery and all of that whereas I never had presence or delivery or anything. When I went on Twitter it showed the one thing I had which was my words. It fit perfectly for me. Glenn Yeffeth: Now is that an obstacle when you think about YouTube? James Breakwell: You know what I actually found out I could rant pretty well. Sitting in front of a camera screen and telling a story is not that different than writing a book. When I'm sitting there with my phone dictating into it, is exactly the same thing when I'm making the video. What's helped me with that it hasn't been just me on my own it was those podcasts. Again the podcasts on their own I wasn't making any money off of them but that was another chance to test out my skills set, to banter back and forth with somebody else and I got comfortable with it and I figured out that if I just had confidence and I paused where I needed to pause, I could tell a pretty good story. Because of that for both of my first two books I was hired to record my own audio books and because of that I've gotten different ad deals. That's another example of just because something is not paying you money now doesn't mean you shouldn't stick with it, because it can give you skills that you need for other things. James Breakwell: That work with web comics that didn't make money on their own but they gave me skills I needed to make money and then it worked with the podcasts. I didn't make money off of those but it give me the ability to do interviews like these or to sit in front of YouTube or do anything else like that it's really paid off in that way. Glenn Yeffeth: Any hints about your next book? James Breakwell: I'm always reluctant to plug a book down the road people are like well I just skip this current book and I'll do the next one. I can tell you about it. I guess you're the guy who give who will give me permission anyways so I can go ahead and talk about it. I'm going to do another survival guide but this one is going to be a little different. Rather than being an entire book about zombies it's going to be a survival guide for a whole bunch of different small scenarios. It's a parenting guide. What do you do if your kid gets abducted by aliens, what do you do if you're sitting in your living room and an ostrich attacks? What do you do if there are killer robots and you're trying to take care of your kid? Just all these other very common parenting scenarios I think we all worry about a little bit. James Breakwell: I'm going to take these other ridiculous situations. Actually it's been the most fun I've ever had writing a book. Because when I dictated the whole first draft just walking through the woods but two going through it, it's just quick hits of humor of here's the crazy absurd scenario go. It's almost like improv comedy so it's been fantastic writing and I really hope that transfers onto the page. Glenn Yeffeth: I can't wait to read it that sounds great. Well James this has been great. Thank you. Remind everybody where they can find you and all your various mediums. James_Breakwell. On YouTube you can search for James Breakwell and my podcasts are Wrong and Wronger and 10 Minutes to Save Your Marriage, and those are both as fun time as well. No matter where you go, if google James Breakwell you'll find me or if you just go to my website exploding unicorn.com that's the hub of where everything is and that's the easiest way to find all my stuff. Glenn Yeffeth: Wonderful. Well James thanks so much for your time we're thrilled to be your publisher and you always deliver fantastic stuff and I can't wait to bring out Bare Minimum Parenting which by the time this airs it should be in stores. James Breakwell: Awesome, thank you so much for having me on. Glenn Yeffeth: Thank you for listening to the Building Books Podcast. If you enjoyed it please leave a review on iTunes or wherever you happen to listen to it or share it on social media. If you're an author who would want to submit a proposal or [inaudible 00:44:47] BenBella books. Please go to benbellbooks.com click on the four perspectives authors button, and it will lead you through a little form that makes it real easy to submit to us. Thank you.